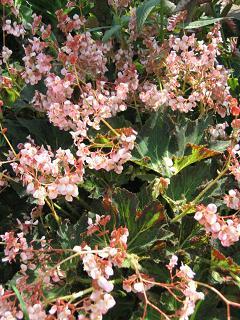 To stimulate and promote interest in begonias and other shade-loving plants. To encourage the introduction and development of new types of these plants. To gather and publish information in regard to kinds, propagation, and culture of begonias and companion plants. To issue a bulletin that will be mailed to all members of the society. To bring into friendly contact all who love and grow begonias. Each member of our branch is automatically enrolled in ABS and receives The Begonian, the official publication of ABS. Members can �adopt� a species, order seeds from the seed fund, order from the ABS bookstore, and attend an annual convention. Locally, we have a monthly meeting with speakers and growing information, as well as raffle tables, exchange plants, and opportunities to buy new hybrids and recently discovered species. We tour gardens, take trips to plant sales, and conduct auctions. There are also �propagation parties� where members can learn to grow begonias from cuttings and leaves. Join us on the second Monday of each month at 7:00 p.m. at the Mounts Auditorium, 531 N. Military Trail , West Palm Beach. We look forward to seeing you. The flowers of Begonia 'Palomar Prince' in February. Chartered on January 22, 1979, the Begonia Society of the Palm Beaches is an official chapter of the American Begonia Society (ABS). Herbert Dyckman founded the American Begonia Society back in 1932. 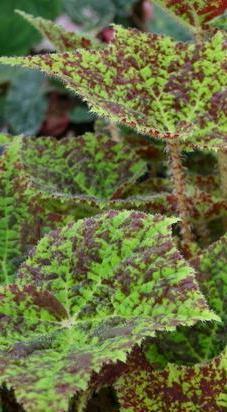 The vivid leaves of Begonia 'Marmaduke'. Stimulate and promote interest in begonias and other shade-loving plants. Encourage the intreoduction and development of new types of these plants. Standardize the nomenclature of begonias. Gather and publish information in regard to kinds, propagation and culture of begonias and companion plants. Issue a bulletin that will be ailed to all members of the Society. Bring into friendly contact all who love nad grow begonias.